This data set provides Level 4 daily estimates of Net Ecosystem Exchange (NEE) of CO2 at a spatial resolution of 30 arc-seconds (~1 km) for seven of the sites covered by the Airborne Microwave Observatory of Subcanopy and Subsurface (AirMOSS) flights, each site spanning ~2500 km2. 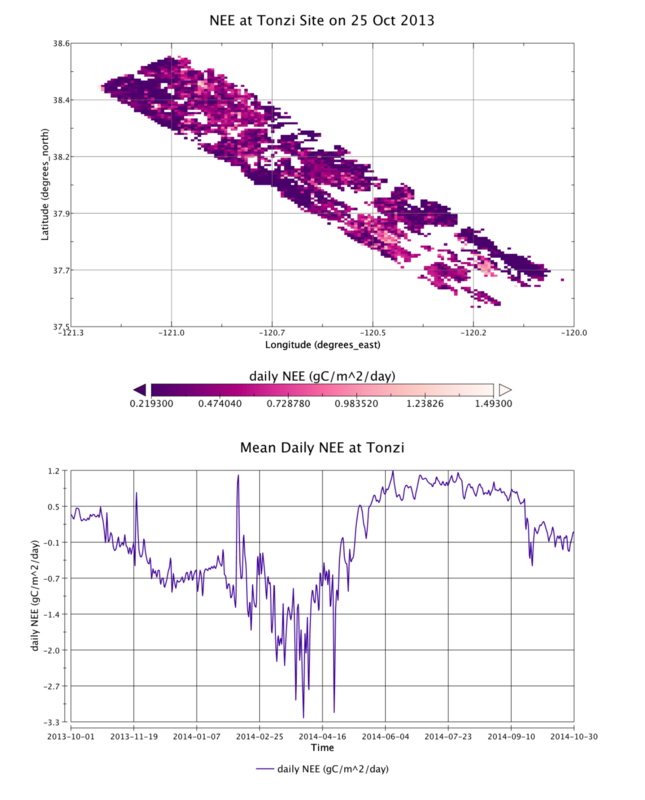 The daily NEE estimates are generally available from October 2012 through October 2014, although the exact time ranges vary by site. The AirMOSS L4 daily NEE were produced by the Ecosystem Demography Biosphere Model (ED2) augmented by the AirMOSS-derived L2/3 root zone soil moisture data as an additional input. The AirMOSS soil moisture data were used to estimate the sensitivity of carbon fluxes to soil moisture and to diagnose and improve estimation and prediction of NEE by constraining the model's predictions of soil moisture and its impact on above- and below-ground fluxes. This data set includes 7 files in netCDF (*.nc4) format. Each file contains the estimated L4 daily NEE at a particular site over the entire sampling period. The algorithm theoretical basis document (ATBD) for this data product is included as a companion file. Figure 1: Spatial and temporal variability in Net Ecosystem Exchange (NEE) of CO2 at the Tonzi Ranch site. Temporal Coverage: Most sites have data from October 2012 through October 2014, although the exact time range varies by site. Table 1. AirMOSS sites where L4 Daily NEE data were estimated. Three additional AirMOSS sites at La Selva, Costa Rica, BERMS, Saskatchewan, Canada, and Chamela, Mexico, do not have L4 Daily NEE data. This data set includes 7 files in netCDF (*.nc4) format. Each file contains the estimated L4 daily NEE at a particular site over the entire sampling period. The algorithm theoretical basis document (ATBD) for this data product is included as a companion file (AirMOSS_L4NEE_ATBD_V2.0_160928.pdf). Table 2. Data fields in the L4A Daily NEE data files. Missing data are represented by -999. The AirMOSS data products and expected science results are tailored to meet the need to reduce uncertainty in estimates of net ecosystem exchange (NEE) through the development of methodologies to integrate remote sensing observations, in-ground soil sensors, and flux tower data into regional/continental flux models. Additionally, AirMOSS data provide a direct means for evaluating RZSM algorithms of the SMAP Decadal Survey mission and assessing the impact of fine-scale heterogeneities in its coarse-resolution products. A key science objective of AirMOSS is a quantitative understanding of the impact of root-zone soil moisture on ecosystem carbon fluxes. The sensitivity of carbon flux to changes in soil moisture was calculated by comparing between ED2 model simulations that did, or did not, make use of AirMOSS soil moisture data. These comparisons are shown in the ATBD document for this data product. For AirMOSS, NASA's Uninhabited Aerial Vehicle Synthetic Aperture Radar (UAVSAR) was flown on a Gulfstream-III aircraft, making frequent flights over ten sites (Figure 2) in 9 different biomes of North America over the course of four years (Chapin et al. 2012). Figure 2. AirMOSS study sites were co-located with flux towers in nine different biomes across North America. Beginning in September 2012, the AirMOSS instrument flew 215 flight campaigns. A summary of flight campaigns by year and site is found in Table 3. Typically, the aircraft made repeat visits to sites in the same region in a single week and then proceeded to another region. Most sites had at least three campaigns per year. The Harvard and Howland forest sites were flown together in a single day. In 2012, Chamela, La Selva, and Tonzi were not surveyed. Table 3. Summary of AirMOSS flight campaigns. Root-zone soil moisture and its spatial and temporal heterogeneity influences NEE. The AirMOSS L4A NEE data were produced by the Ecosystem Demography Model (ED2), augmented by inputs from AirMOSS L2/3 RZSM data. Specifically, the AirMOSS L2/3 RZSM data were used to estimate the sensitivity of carbon fluxes to soil moisture and to diagnose and improve estimation and prediction of NEE in ED2. The Ecosystem Demography Biosphere Model (ED2) is an integrated terrestrial biosphere model incorporating hydrology, land-surface biophysics, vegetation dynamics, and soil carbon and nitrogen biogeochemistry (Medvigy et al. 2009). The inputs include: meteorological forcing data, soil properties information, definition of initial ecosystem structure and composition, and prescribed phenology data regarding the timing of leaf flush and leaf drop. AirMOSS L2/3 soil moisture data were used to constrain the model’s predictions of soil moisture and its impact on above- and below-ground fluxes, as described Figure 3 below, and in the algorithm theoretical basis document (ATBD) for this data product, included with this data set, AirMOSS_L4NEE_ATBD_V2.0_160928.pdf. Figure 3. 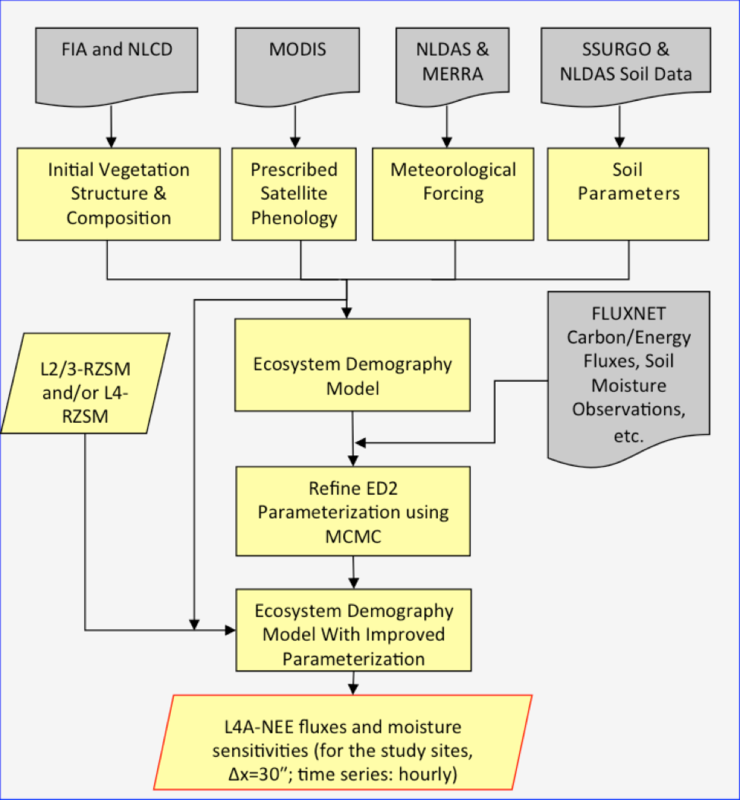 Flowchart describing the inputs, forcings, and initial conditions needed to produce the L4A-NEE products from the ED2 model.